The aurie an population figurs are the sum o the figurs o the five municipalities (leetit abuin) that mak up the Distrito Metropolitano. Caracas (Spaingie pronunciation: [kaˈɾakas]), offeecially Santiago de León de Caracas, is the caipital an lairgest ceety o Venezuela. It is locatit in the northren pairt o the kintra, follaein the contours o the narrae Caracas Glen on the Venezuelan coastal muntain range (Cordillera de la Costa). The glen's temperaturs ar warelike. Terrain suitable for biggin lees atween 760 an 910 m (2,493.44 an 2,985.56 ft) abuin sea level. The glen is close tae the Caribbean Sea, separatit frae the coast bi a steep 2200 m (7400 ft) hie muntain range, Cerro Ávila; tae the sooth thare ar mair hills an muntains. El Distrito Metropolitano de Caracas (Metropolitan Destrict o Caracas) includes the Distrito Capital (the caipital ceety proper) an fower ither municipalities in Miranda State includin Chacao, Baruta, Sucre, an El Hatillo. The Distrito Capital haed a population o 2,097,350 as o 2009, while that o Distrito Metropolitano wis estimatit at 3,196,514 (as o 2008). At the time o the foondin o the ceety, mair nor fower hunder years ago, the glen o Caracas wis populatit bi indigenous fowks. Francisco Fajardo, the son o a Spainyie caiptain an a Guaiqueri cacica, attemptit tae establish a plantation in the glen in 1562 efter foondin a series o coastal touns. Fajardo's dounset did no last lang. It wis destroyed bi natives o the region led bi Terepaima an Guaicaipuro. This wis the last rebellion on the pairt o the natives. On 25 Julie 1567, Caiptain Diego de Losada laid the foondations o the ceety o Santiago de León de Caracas. The foondation −1567 – “A tak possession o this laund in the name o God an the Keeng” These wur the wirds o Don Diego de Losada in foondin the ceety o Caracas on 25 Julie 1567. In 1577 Caracas became the caipital o the Spainyie Empire's Venezuela Province unner Govrenor Juan de Pimentel (1576–1583). Durin the 17t century, the coast o Venezuela wis frequently raidit bi pirates. Wi the coastal muntains as a barrier, Caracas wis relatively immune tae such attacks – ane o the raisons it became the principal ceety o the region. Housomeivver, in the 1680s, buccaneers crossed the muntains throu a little-uised pass while the toun's defenders wur guardin the mair aften-uised ane, an encoonterin little resistance, sackit an set fire tae the toun. As the cocoa cultivation unner the Compañía Guipuzcoana de Caracas grew in importance, the ceety expandit. In 1777, Caracas became the caipital o the Caiptaincy General o Venezuela. José María España an Manuel Gual led an attemptit revolution aimit at unthirdom, but the rebellion wis put doun on 13 Julie 1797. Caracas wis ultimately the steid o the signin o a Declaration o Unthirldom on 5 Julie 1811. 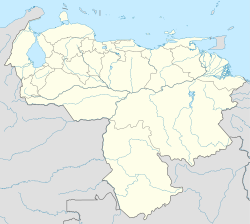 In 1812, a yirdquauk destroyed Caracas. The revolutionar war continued till 24 Juin 1821, when Bolívar defeatit ryalists in the Battle o Carabobo. Caracas grew in economic importance durin Venezuela's ile boom in the early 20t century. Durin the 1950s, Caracas began an intensive modrenization program which continued throuoot the 1960s an early 1970s. The Universidad Central de Venezuela, designed bi modrenist airchitect Carlos Raúl Villanueva an declared Warld Heritage Steid bi UNESCO, wis biggit. New wirkin an middle-cless residential destricts sproutit in the glen, extendin the urban aurie towards the east an sootheast. Joinin El Silencio, designed bi Villanueva an aw, wur several wirkers' hoosin destricts, 23 de Enero an Simon Rodriguez. Middle cless developments include Bello Monte, Los Palos Grandes, Chuao, an El Cafetal. The dramatic chynge in the economic structur o the kintra, which went frae bein primarily agricultural tae dependent on ile production, stimulatit the fast development o Caracas, an made it a magnet for fowk in landwart commonties who migratit tae the caipital ceety in an unplanned fashion searchin for greater economic opportunity. This migration created the rancho (slum) belt o the glen o Caracas. ↑ "Population projection for federal entities" (PDF). Archived frae the oreeginal (PDF) on 9 October 2012. Retrieved 30 April 2010. ↑ Madrid city council webpage "Mapa Mundi de las ciudades hermanadas" Check |url= value (help). Ayuntamiento de Madrid. Retrieved 22 July 2009. Wikimedia Commons haes media relatit tae Caracas. This page wis last eeditit on 10 Mairch 2018, at 18:59.